One of the most important (and toughest) parts before starting on the mood board was coming up with a red and green color palette that would work for the room. 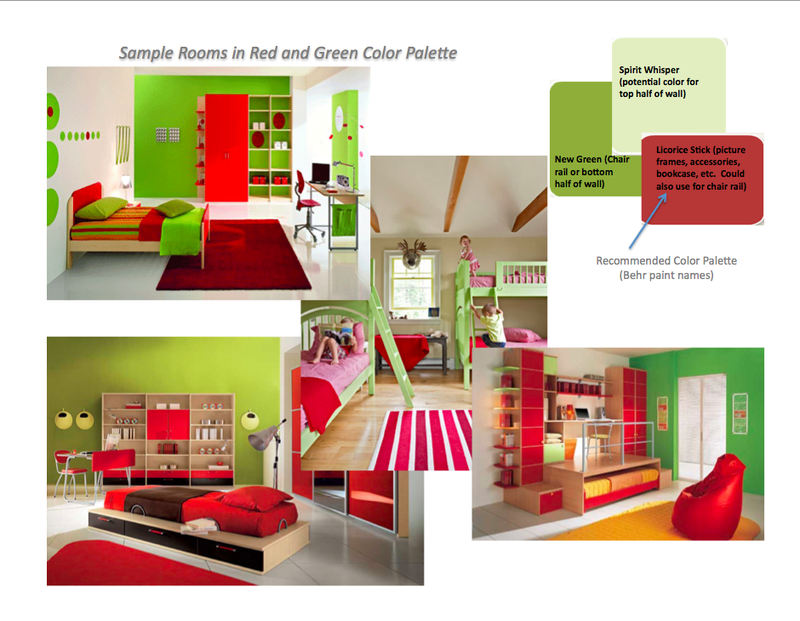 I’m sure if I had formal interior design training I would have known the color ‘rules’, but instead I searched online for images of rooms that I thought pulled off the color combo well. Turns out, red and green can look pretty cool together as long as you vary the intensity and amount of the two colors. I really liked a muted army green paired with lacquer red accents. 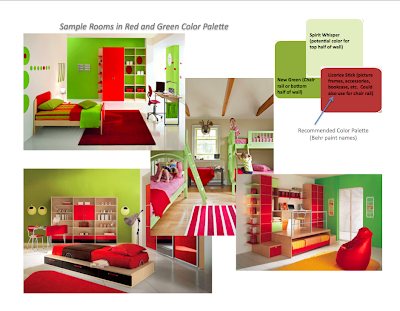 Like these example rooms, the green is often used on the wall with red brought in through furniture and accessories, and there is still a good dose of white in each room to prevent the colors from being overwhelming. This was the new room on a piece of paper. On the left is the main wall behind the bed that shows a potential use of the paint colors. Beckett’s room had a chair rail running around the middle of the wall that I thought would look cool painted bright red, with the feature wall painted green and the rest of the walls white. 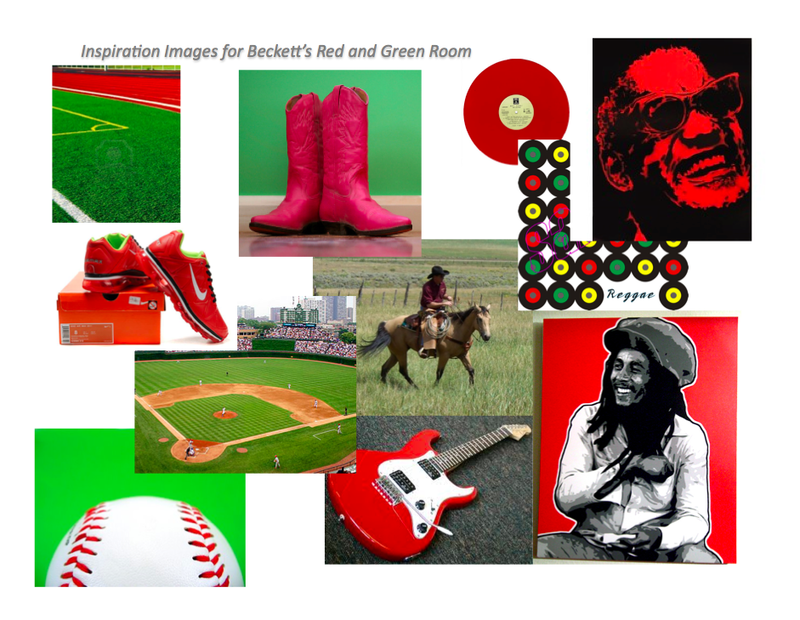 To bring in all his varied interests in a cohesive way, the main wall would have a grouping of black and white photos of Beckett’s favorite things: baseball/Babe Ruth, music/Bob Marley, and cowboys. And that was it! This room inspiration is now in the hands of Michele and Beckett, but I hope they keep me posted on how it comes out. I had so much fun on this first design project that I am anxious to do more (and have another Craigslist ad out there at this very moment…no takers yet!). 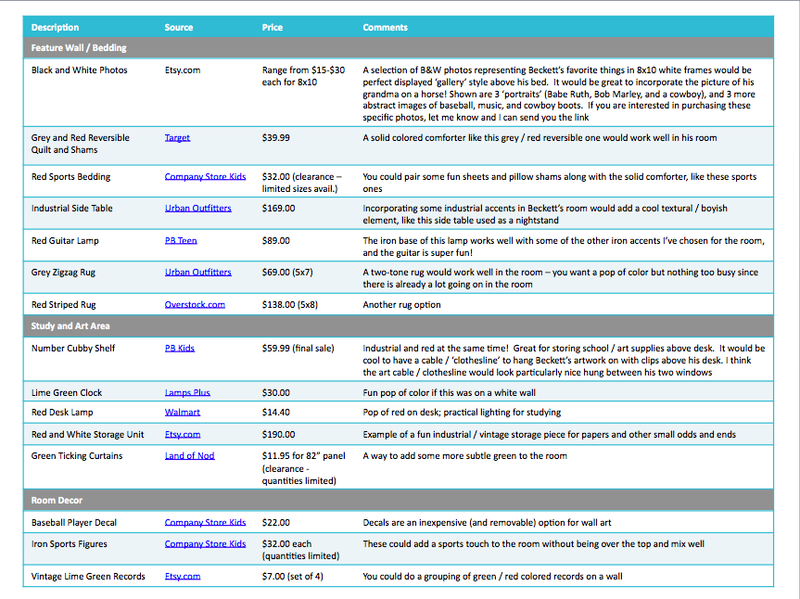 I plan to keep my design fees low for now as I gain more experience so if you know anyone who could use help like this, please send them my way! 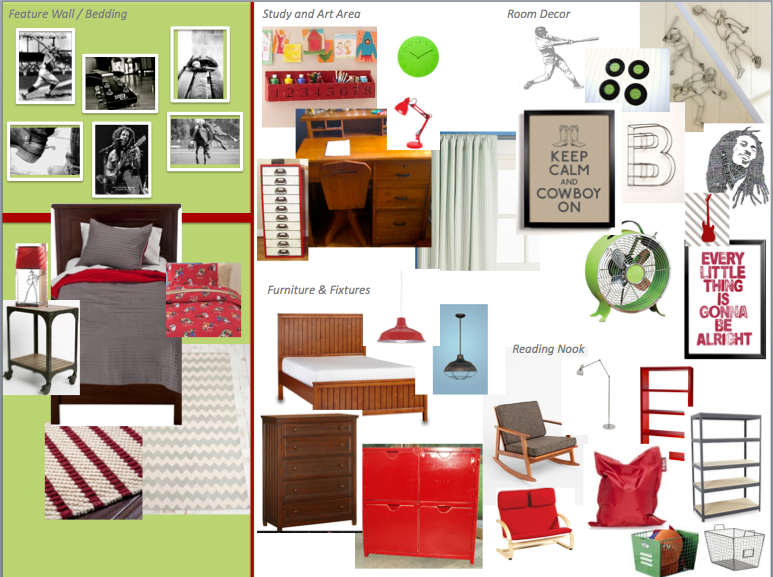 I have a particular interest in kids rooms, but would be happy to take a shot at any room in the house. I thought I commented on this a few weeks ago, but my comment obviously didn't save! I am proud of you, Haeles, and quite impressed with your work!! I still have three empty rooms (and some not empty ones) in desperate need of decorating… I am camera-less right now but as soon as I get another one I will be sending you pics for a consult!